Corfe Bears > Charlie Bears > DRINGLE (SLOTH) 12"
View other bears from Charlie Bears Bearhouse Bears To Pre-Order. Charlie Bears Dringle is from the 2018 Bearhouse collection. A Sloth is one of the slowest moving animals in the world, as they don't have much energy because they only eat leaves. Dingle, the Bearhouse Sloth is really adorable, with his thick fur and dopey expression and he will be happy lazing about all day. He has 3 claw-like toes on each paw, so will be able to hold on tight to you and snuggle down while he sleeps...... which is a lot!! He also wears a satin and organza ribbon. Available to pre-order with no deposit. Click on 'Add to Cart', then click 'Pre-order' on the right. No payment required until the bear is in stock ready to dispatch. Delivery quantities confirmed by Charlie Bears. Awaiting delivery date. 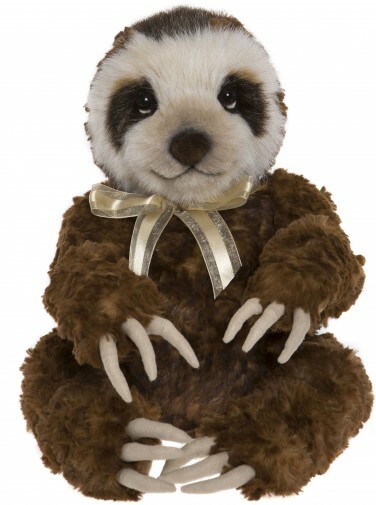 "Have received Dringle the Charlie Bear Sloth today, fantastic since I only ordered him yesterday. He is stunning, it was love at first sight, thanks to everyone at Corfe Bears, excellent service as usual x"